I have a Sharkline Odyssey 52" x 20' Round Pool, I just installed the beaded liner, I noticed that there is no plastic coping to secure the liner, it seems to fit and hold the water without any problem. My question is: Do I need the plastic coping, will there be any problems without it? Hi Bill. Coping strips are only used to hold overlap liners in place, they are not used with beaded liners. If your pool had a j-hook bead then it probably had metal stabilizer rods that would go over the liner bead to give the wall some stiffness at the top. Other beaded liners use a bead receiver. The bead receiver acts as a stabilizer rod and in most cases that's all you need. There are bead receivers that need the metal stabilizer rods over top of them. Every brand of pool is a little different so be sure to read the instructions that came with the pool to be sure you have used all of the parts you were supposed to. More information about liners and installation can be found on these pages. Hi Andrea As there are a million makes and models of above ground pools I can't help much with finding the parts. The air bubble at the top can be removed by taking off the rails and pulling the liner over the wall tight. I would recommend lowering the water level by about a foot before you start. It will relieve some of the pressure from the top rails and make installing them a little easier. When the pool was installed the coping was used on the top edge of the pool wall with the liner over this, then the top metal rails on the liner. 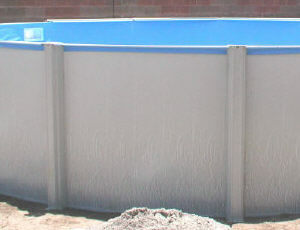 Is it possible, one section at a time, to remove the top metal rail and take the coping out from under the liner and reinstall without draining the pool? There is plenty of liner hanging over the edge of the pool and is loose on the inside wall of the pool so there appears to be no pulling pressure from the water. I am curious as also, in one section, I had a fence post fall onto the top edge and bend this top rail. Hi Matt. To make this work you would need to be working on about three sections at a time. Make use of cloths pins to hold the liner in place before you put the coping over it. It takes several rails worth of room to set the liner so that it is tight enough and looks good. Once you start you would be removing rails and reinstalling rails as you go, so that at all times you are working in about a three rail space. This is also a good time to tuck the liner back into the pool if it was not done this way in the beginning. I do not recommend that you try this with a pool full of water. In most cases when you remove a rail from a full pool it takes several people pushing and pulling to get the top rail holes to line back up. The top of the pool spreads just enough to make this difficult. You would be better off to lower the water level to about half way. This takes most of the pressure off the top of the pool and will make it much easier to work with. Don't take out any more water than you need to and you won't be taking any chances of the liner shrinking. While the damaged rail if off the pool you should be able to lay it on a flat surface and use a rubber mallet to flatten it. 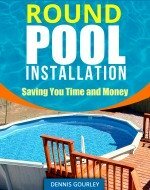 I have just installed a 24 foot round above ground pool and have the water filled to 1 inch below the water intake hole. I have a few questions about the liner install. 1. When we installed the liner we installed it over the rounded metal stabilizer rods (looks exactly like coping) and then put the rounded plastic coping over top of the metal ones. I have a feeling that I should have removed the metal ones and just had the liner resting on the pool wall and then put the plastic coping over. 2. I have made sure there are no wrinkles, but I have noticed that we have a little bit of extra liner that we need to pull snug along the top. Going by what I have read on this site so far, I should be fine to remove a few top rails at a time and pull the extra liner snug with the wall so that there is no extra hanging there?? Anytime you have round coping strips they are to be installed over top of the metal retaining rods. It sounds like you did it right. Be sure to pull the liner tight before adding anymore water. You should not have any problem doing his and it will look a lot better than having a liner that's loose around the top. I have done this with pools full of water and had to have my helpers push the last rail, for all they were worth, to enable me to line the holes up correctly so I could shoot the screws in. 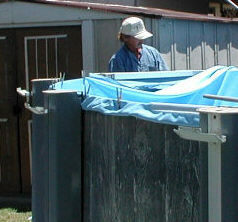 More photos of this pool being installed are on this page.